Rephone is a small project that is made up of a bunch of modules that allows you to assemble together your very own small cell phone. Displayed at the Maker Faire in New York, the least interesting thing about the Rephone kit is making it out of a cute little cardboard-encased phone. Seeed Studio, which is the group behind the project has made lot of modules and an SDK that allows you to build out almost any kind of cellular-based device that you can think of. They have fastened it to a kite to give you with real-time telemetry. They have put it around a dog collar so that you can call him to come home or use it to locate your dog. In addition, they have strapped it to a lamp, a door and even a table. Launched on Kickstarter last week, the project has already gone past its small goal of $50,000. As Seeed already has lots of experience making these tiny modules, it might have prompted them to keep a modest goal. Based in Shenzhen, the company has "been providing open source modules to makers for almost 7 years," says Seeed's Eric Pan. Rephone's modules and SDK will also be open sourced. The central part of the Rephone kit is a very small little module with Bluetooth Low Energy radios and GSM. While it requires a a nano-SIM card, Seeed may think of making something with 3G or LTE in a future version says Pan. However, you would not actually need it for the functions that you would mostly want to use Rephone for. "If you just want to unlock a door or turn on a lamp, 2G is good enough," says Pan. Plug in a prepaid SIM card that you can manage with sms or data. 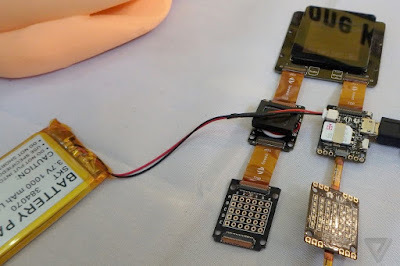 However, if you want to go out there and make your own tiny phone, you can take the kit that has all the parts you need, including a tiny little touchscreen and a cardboard enclosure that you tie up with thread. The Kickstarter still has about a month left in its run. Based on how much you pay Seeed will be shipping out modules, of which some can be shipped as early as next month. With the way the project has shaped up, it is likely that there may not be too many delays with the project.